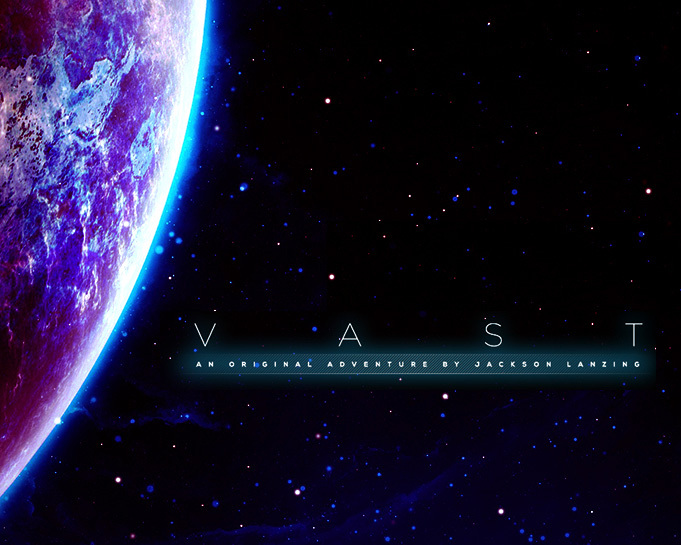 VAST was a livestream science-fiction RPG series from the mind of phenomenal writer Jackson Lanzing, which aired for two seasons exclusively on Geek & Sundry Alpha. Set in an original sci-fi universe, each season of VAST followed not one but two ships: the Pac-Ha Peacekeep vessel Avalon and the Screaming Valor, a warship of the infamous Brightest Eye. VAST alternated between the two crews each week, punctuating this parallel storytelling with “unification” episodes that brought the crews of both ships together. Jackson ran the creative on VAST like a TV writers’ room, and I was fortunate enough to be a staff writer on the show. Episodes of VAST weren’t scripted like an episode of traditional television; as with all tabletop roleplaying games, the cast of VAST would improv their own dialogue on the fly, in response to situations that were as fresh to them as they were to the audience. So rather than writing traditional scripts, VAST writers were tasked with producing RPG modules for Jackson to GM live every Monday night when the show aired. It was an exciting format, a rare example of a series in which the cast and even the creators didn’t necessarily know what was coming. We writers set the tent poles, but our best-laid plans could be foiled or enhanced based on the agency of the players and the roll of a 10-sided die. VAST will not be returning to Alpha after Season 2, but the rights have reverted to Jackson, and everyone involved is committed to bringing the show back in some form. In the meantime, I’ve been running a private home game called VAST Frontier, set on the fringes of the VAST universe, with players including Jackson himself, members of the cast and writing staff, and 20-odd more of my closest friends. The space station where the campaign is set is a ship of secrets, but once those start to be revealed, I hope to chronicle the journey here on Coefficient of Fiction.